Cheap Summer Houses - Who Has The Best? 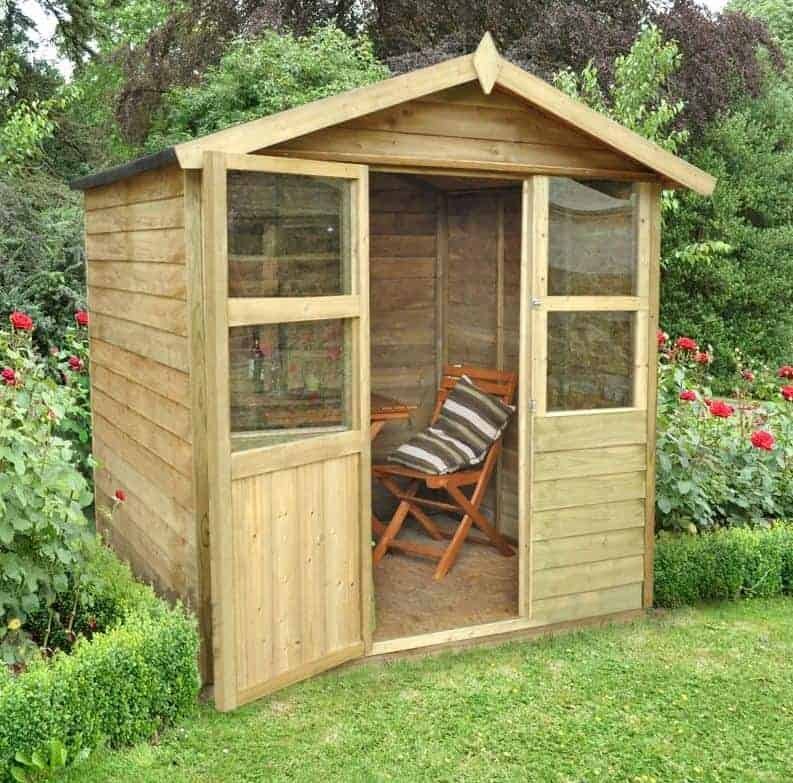 Cheap summer houses are becoming increasingly popular, so whilst a typical summer house may cost in excess of a thousand pounds you can still find a great addition to your garden for a much more reasonable price. 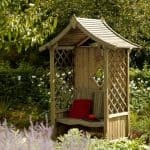 A summer house can be a practical solution, in that it can be used for garden storage purposes, but it can also be an ideal place to relax at the end of a day’s gardening, or even a place to entertain guests on a summer day. While a budget summer house will necessarily be one of more compact models on the market, they still have a lot to offer, which is why we’ve created our WhatShed guide to the 20 best cheap summer houses available to buy online in the UK today. There were many factors to consider when choosing our 20 best cheap summer houses, including price and value for money, design and appearance, and durability, but of course we also had to define just what a cheap summer house is. For the purpose of this league table we’ve decided upon summer houses that cost less than seven hundred pounds, although in this broad price range we have buildings that cost much less than that. It’s time to reveal the UK’s top 20 cheap summer houses that can be bought online right now. With an increasing number of cheap summer houses available to buy online in the UK picking the top 20 was a difficult task, and picking the number one budget priced summer house was even harder. Well done then to the Rowlinson Eaton summer house that tops our list of the best cheap summer houses thanks to its attractive design and great value for money. 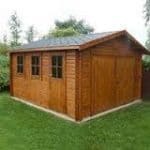 Whether you’re searching for summer houses cheap or expensive, garden sheds, or playhouses for the children, WhatShed bring you in depth reviews that can help you make a great choice every time. This Rowlinson summer house really caught our eye, and its combination of traditional good looks, a larger than average base size, and a very good value for money price tag helped it climb to the number one position in our list of the very best cheap summer houses. It’s not the most expensive summer house in our league table, but it is the biggest, with a base size of 2.13 x 2.64m. With a ridge height created by the apex roof of 2.22m as well, there’s lots of room to move around in, or simply to relax in your favourite chair and look out at the garden. This is one of the most attractive cheap summer houses that we’ve reviewed, and that’s partly due to the Georgian style glazing that occupies two thirds of the double doors as well as the two narrow and long windows adjacent to them. We also liked the canopy formed by the overhanging roof, especially as this creates a very useful area of shade on a hot day. It’s not only decorative therefore, but very functional too. 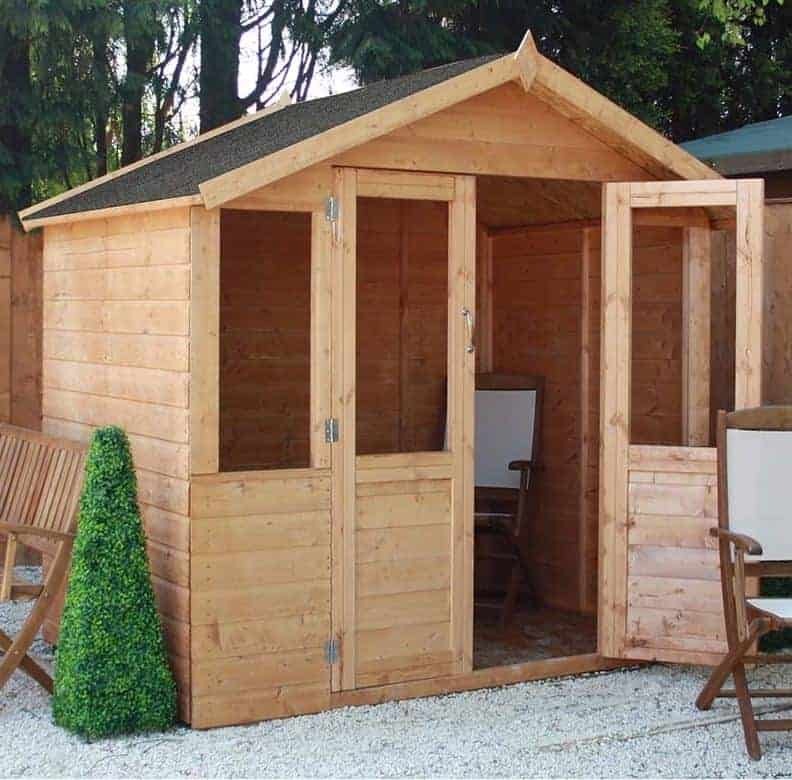 It’s this combination, and the fact that this tongue and groove clad shed also comes with a 10 year guarantee, that makes it our number one summer house that’s available to buy online for less than seven hundred pounds. Cheap summer houses come with two distinct advantages for the consumer; the first, of course, is that they are much easier on the pocket, but the second is that they are typically more compact and therefore don’t take up as much garden space. This is a factor that’s particularly applicable to this building, as whilst it still offers a reasonable internal capacity of over 48 square feet it’s ideal for shallower gardens thanks to its reverse apex design. What also impressed us is that the roof not only had a different orienatation, it’s also very tall at 2.40m. This means that there’s lots of headroom to move around in, and also lots of vertical storage space with the addition of shelving units. What impressed us most, however, was that not only was tongue and groove cladding used throughout, it had also been given an initial pressure treatment. This very effective and long lasting anti-rot treatment means that the manufacturer has been able to provide a 15 year warranty, and it also means that the customer themselves doesn’t have to apply their own annual treatments of wood preserver as we often find. This creates even better value for money for this attractive glass fronted building, and is why it takes the runner up spot in our list of the 20 best cheap summer houses. Cheap summer houses come in many forms as well as in many sizes, and we particularly liked the added value that this model provided by including a verandah as well. It’s a perfect place to sit garden chairs or a patio set and it’s protected from the elements by the canopy created by the overhanging apex roof. This was the first thing that caught our eye, and makes this a highly attractive building that you’ll be proud to have in your garden. With an eight foot by seven foot base size, this is one of the more spacious buildings in our league table of the best cheap summer houses, and because it features wide opening double doors it’s easy to move items of furniture inside that can make this summer house an even more enjoyable building to spend time in. These double doors are half glazed, and there are two further windows which we were pleased to see were made from tough and shatter resistant styrene.Tongue and groove cladding is used throughout, which isn’t something we always see on garden buildings as affordable as this. For a price of less than six hundred pounds, with a 10 year guarantee against rot included by the manufacturer as well, this represents very good value for money. 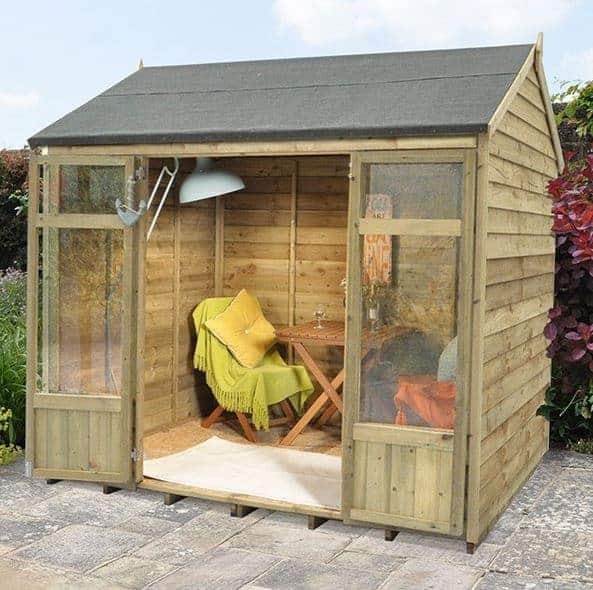 Six foot by six foot is an ideal size for cheap summer houses, as it won’t use up too much lawn or garden space, and yet there’s still enough room to sit down inside without feeling too hemmed in, and of course it can also be used as a storage facility or even as a garden shed. 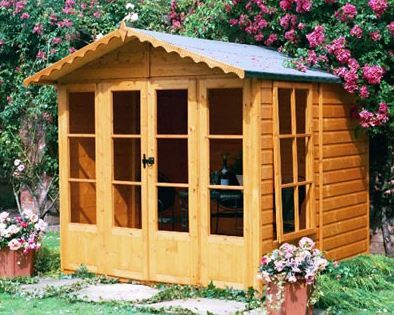 This particular summer house also adds exceptional value for money to the list of benefits, especially as it comes with a 15 year guarantee against rot thanks to the effectiveness of the pressure treatment that the manufacturer has applied. This is the cheapest pressure treated building in our lis to feature strong shiplap cladding, and it’s for this reason that we rate it among the top five cheap summer houses available to buy today. The interlocking cladding forms the same function as the felt covered apex roof, in that it effectively causes rainwater to run off so you won’t have to worry about the contents within the summer house keeping dry. There is only a single hinged door, but its width of 0.65m still allows most items to be taken into or out of the building without too much trouble, and once inside there are two windows to complement the half glazed door creating a very light and welcoming interior to these cheap summer houses. All of the cheap summer houses in our list so far have adhered to the traditional rectangular styling with an apex roof above them, but now we come to something rather different. 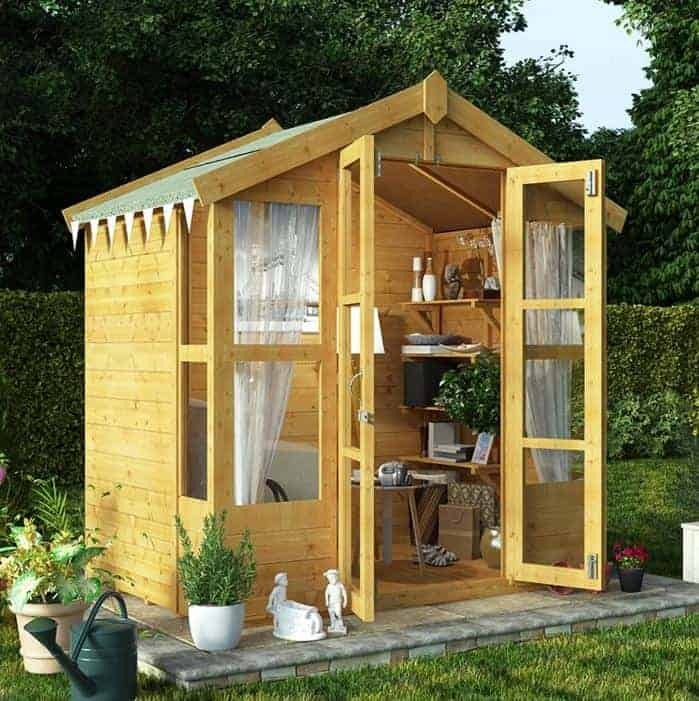 This is a corner summer house, which means that it has a pentagonal summer house which makes it easy to fit snugly into the corner of a garden. 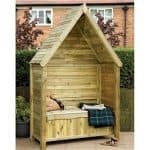 This makes it perfect for gardens that have a very restricted space, and yet the base width and depth of 2.90 and 2.24m respectively still mean that there’s a comfortable amount of space within especially as, unlike most of the corner summer houses we review, it still features an apex rather than pent roof. Another things we particularly liked about this building is that natural light is allowed in from multiple angles, and not only from the front, as the front double doors are fully glazed, and there are also two long windows on the sides next to them. We were also pleased to see that all the timbers had been pressure treated, including the integrated floor joists which aren’t something that we always see on the cheap summer houses we review. It’s only the price tag, the highest among the buildings which meet our definition of cheap, that stops this summer house from being ranked even higher. When reviewing cheap summer houses we always prefer to see tongue and groove cladding used as this creates a very strong and stable structure. On this occasion overlap cladding has been used, and whilst this is significantly thinner, at 7mm, than that of most of the garden buildings in this league table it still felt stable once fully assembled. It also makes the building much more cost effective, and allows this well sized and very durable building to be sold for less than five hundred pounds. 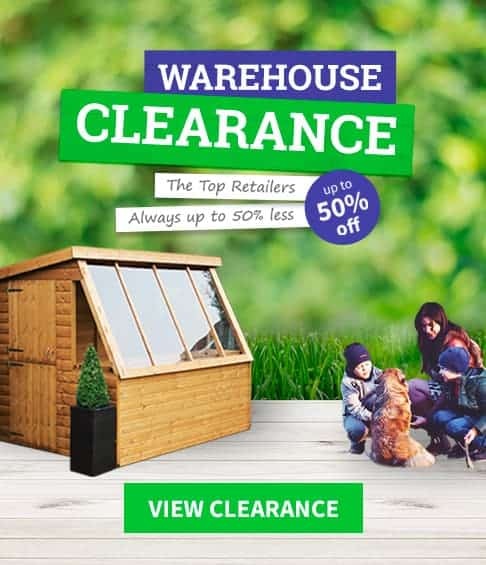 It’s this very good value for momey which sees it achieve a position in the top half of our budget summer house league table. What makes this so durable, despite the thin cladding, is that it has been fully pressure treated. A mark of just how effective this is can be found in the 15 year warranty given by the manufacturer, which is as long as any of the warranties we see on cheap summer houses. We also liked the reverse apex roof, one of two buildings on this list to feature one, making it ideal for consumers whose gardens are wider than they are deep. With floor joists lifting the solid sheet flooring above the threat of ground moisture as well, this is a great value summer house that should last and last. 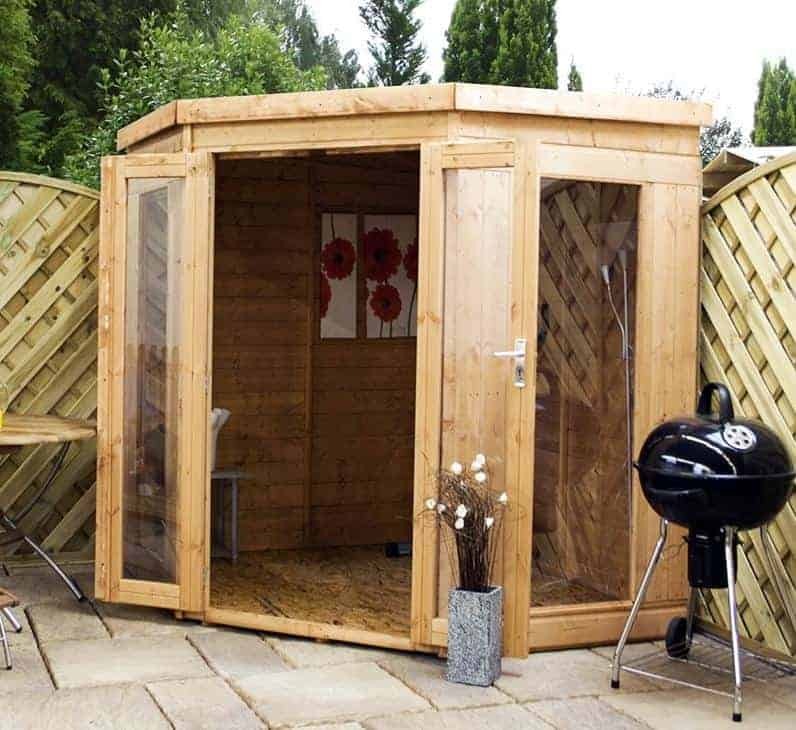 This corner summer house has a pent roof, which not only means that it fits easily into a garden where space is restricted, it also means that it may be possible to hide it away behind a wall or fence. That makes it one of potentially one of the most secure cheap summer houses in our top 20 list, particularly as it also features a secure key operated lock. 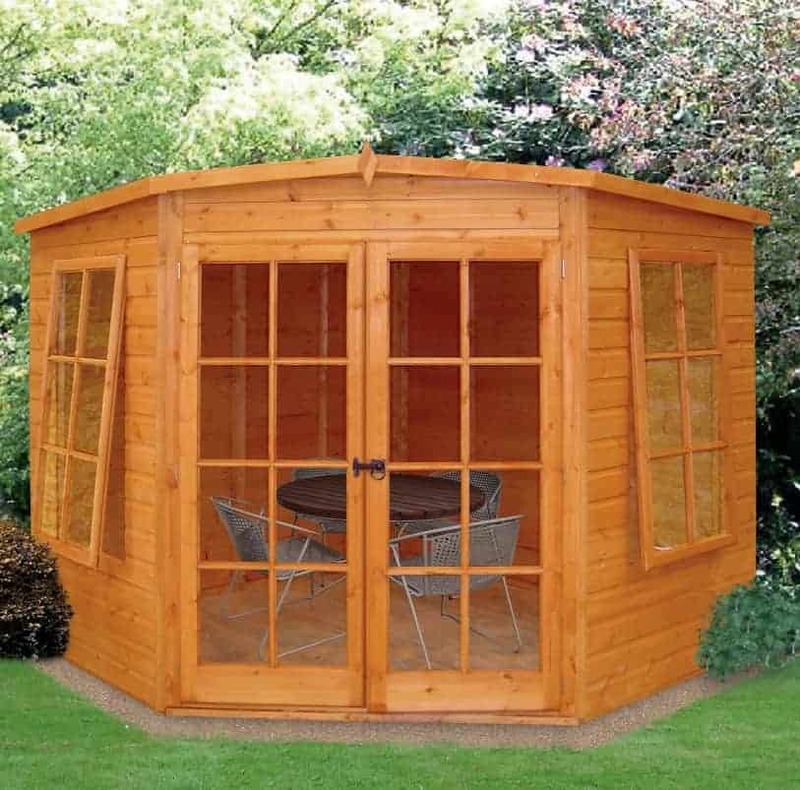 With tough shatter resistant glazing used as well, this is a summer house that you can feel confident about leaving furniture and even electrical goods inside, which is why it gains such a high position in ou league table. Boasting a five sided design, the front face is completely dominated by the styrene glazing as the double doors are both full glazed. 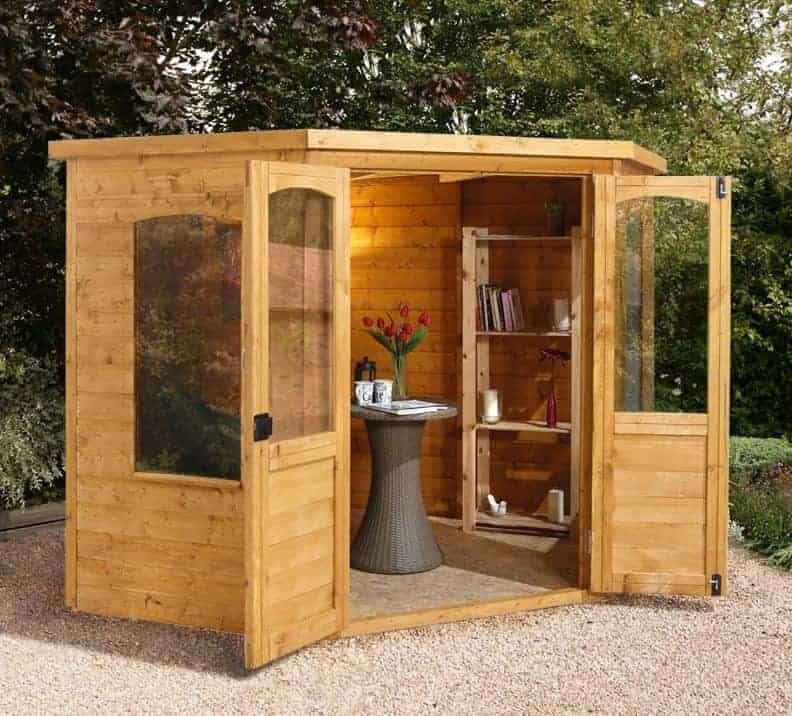 With two further windows on the side panels, there’s lots of natural light inside which is why we think this could be a great choice as a garden office in the summer months. For people looking for good looking, space saving, and versatile cheap summer houses with rain repelling shiplap cladding, this is certainly worth adding to the short list especially as it also comes with the reassurance of a 10 year manufacturer’s guarantee against wet rot. This is the third of the cheap summer houses in our top 20 list that features a corner design, but that just shows how effective their unique design when it comes to both saving precious space and having an affordable price attached. This has slightly less interior space than the corner summer house above it, with both the width and depth measuring 2.05m and a peak height at the top of the pent roof of 2.13m, and this accounts for the relative positionining, and yet it still has a lot to offer, not least its attractive and traditional styling. It’s the glazing which typically catches our eye with both expensive and cheap summer houses, after all it’s this that makes them such a bright, warm, and pleasant environment to spend time inside when the sun is shining. The glazing on this particular building however really stood out for us, and that’s because it is attractively hatched in a Georgian design, including on the fully glazed double doors that can be secured with a bolt. We were pleased to see that the two side windows can be opened as well to allow for easy ventilation, a feature that we always welcome but which we don’t always see on timber summer houses as inexpensive as this one. This traditionally styled summer house looks very attractive, and that’s because the overlap cladding, in conjunction with the apex roof above it, looks fashionably rustic. On the downside, of course, the overlap cladding is not as thick or strong as the tongue and groove timbers that we see, although it still does a good job of carrying rainwater harmlessly away and is the main reason why this is such an affordable garden building. 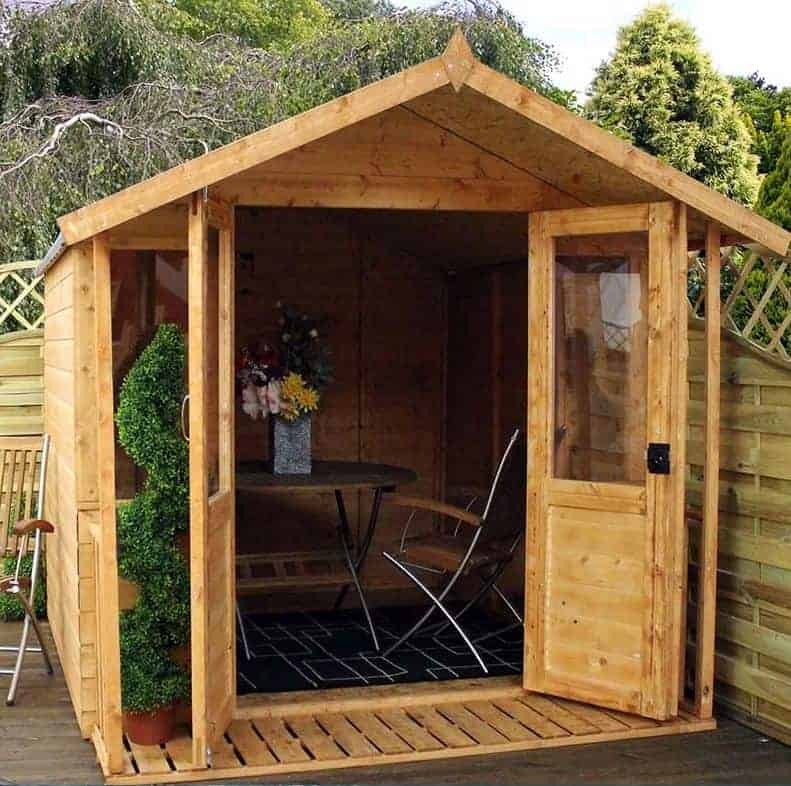 It’s not only one of the lowest priced cheap summer houses on our list, it’s also pressure treated and therefore comes with a 15 year warranty against rot as well. That’s a winning combination, and is why it features in the top half of our WhatShed guide. 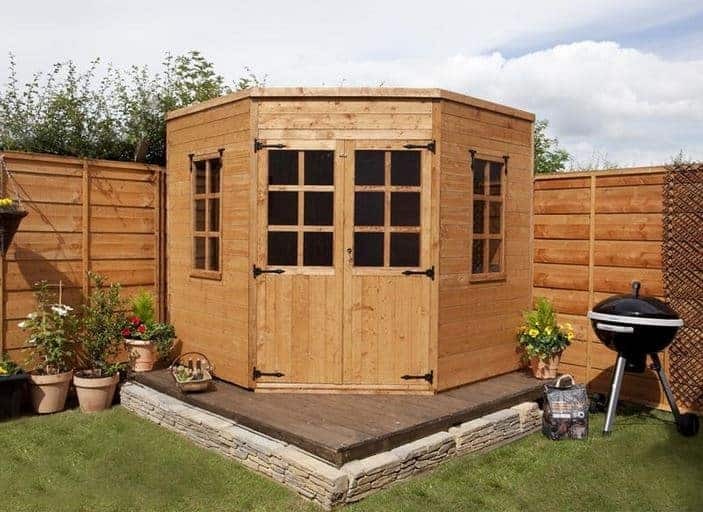 The lightweight nature of the cladding, and the relatively small base area of 1.78 x 1.73m, makes this quite easy to assemble, even for those who’ve never installed a shed or summer house before, although a professional installation service is also available as an optional extra. There’s lots of glazing as well, thanks to the double doors and two fixed windows, and we were pleased to find that, in common with many of the cheap summer houses we review, styrene had been used which is reliable and shatter resistant. 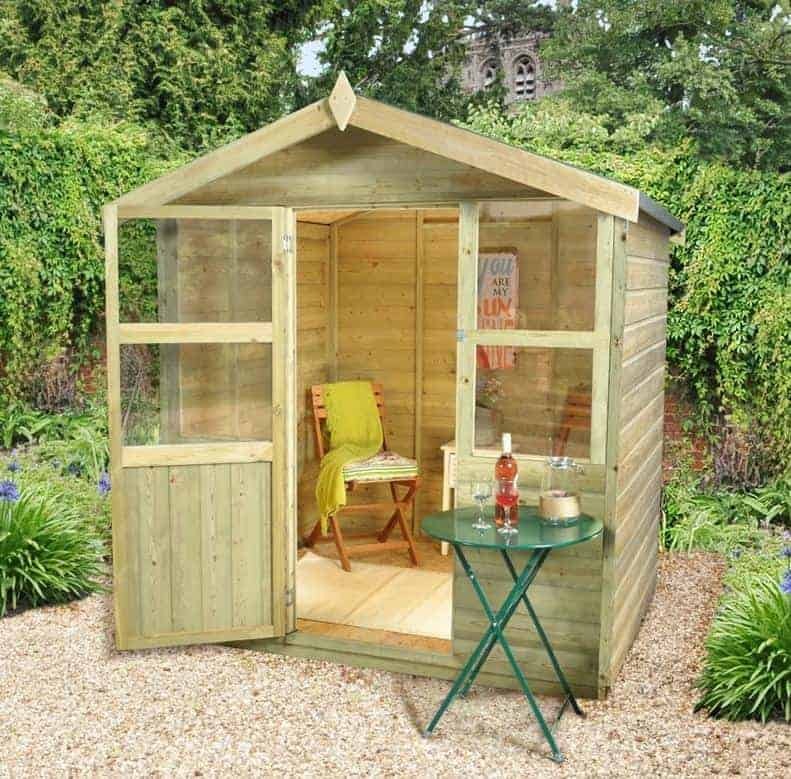 This is by far the largest of the cheap summer houses on our list, which makes it ideal for those who want an accommodating garden building that they can relax in yet which won’s stretch their budget too far. In fact, with its base width of 3.13m and a base depth of 3.83 under an apex roof that reaches a peak height of 2.23m, there’s easily enough room to entertain guests as well here, making it the perfect location to hold a dinner party in. With so much to offer at such an affordable price it’s only the omission of a floor which prevents this being placed much higher up our league table, although one can be added for between £112 and £145. Thanks to its more generous dimensions there’s more room for glazing as well, and in fact there are 16 individual glazed panels on this building, including six on the centrally positioned double doors. That’s more than we find on any other of the cheap summer houses we review, and means that natural light reaches even to the rear of this building on a sunny day. If size and value for money are your main considerations when choosing a summer house, then you should certainly take a look at this one. 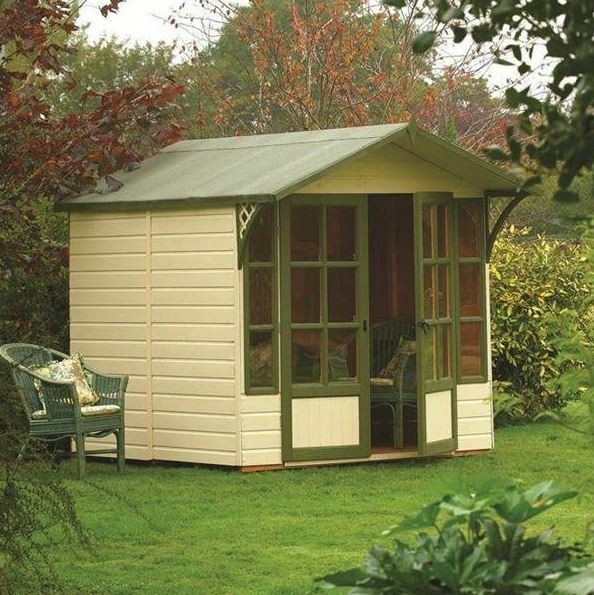 We’ve reviewed lots of Windsor garden buildings, and we’re invariably impressed by the high quality components used and their attention to detail. We were pleased to see, then, that these traits were still found even in their cheap summer houses such as this seven foot by five foot model. It adheres to the classic style with half glazed doors that come with a key operated lock as standard, and two fixed windows alongside them, but this is enough to ensure that the interior is very well illuminated when the sun shines. One feature which we don’t always see on the cheap summer houses we review is a slightly overhanging canopy roof, and this creates a shaded area as well as providing further protection against rain to the front aspect of the summer house. This is one reason that the manufacturer has been able to provide a 10 year warranty, although this is dependent upon the owner carrying out annual retreatments with wood preserver. The apex roof also reaches up to 2.20m high, creating lots of vertical space inside the building. 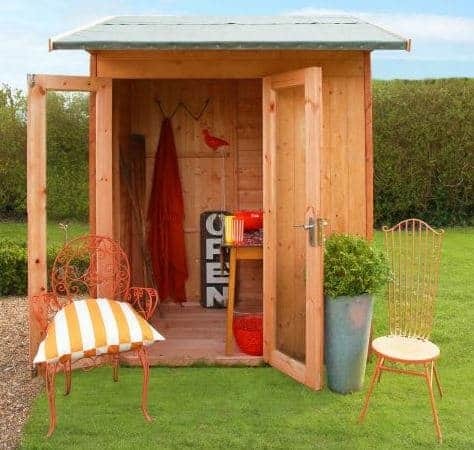 What we liked most, however, is the price of less than four hundred pounds, which makes this the cheapest shiplap summer house in our WhatShed top 20 league table. Corner summer houses such as this one bring significant advantages to those who want a well constructed garden building to relax in, yet don’t have much space in which to position one. It has to be said, however, that the profusion of corners also means that the area available inside is less than the base depth and width of 2.29m on this summer house suggests. Nevertheless, there’s still enough room to situate a pair of chairs or a sofa, or maybe furniture for a home office, and the wide opening double doors found on these cheap summer houses make it easy to manoeuvre such objects in and out. We always find pent roofed corner buildings such as this very attractive, but we particularly liked the look of this model. It features smooth tongue and groove cladding which gives the summer house a touch of glass as well as helping to lock rain out and thus keep the interior dry, but what made this different from other cheap summer houses is that the four glazed panels are curved at the top. It’s a little touch, but a very elegant one, and one that shows the attention to detail that the manufacturer has taken during the construction of this summer house. Whilst we have determined £700 as the cut off price for the cheap summer houses in our top 20 list of those available to be bought online in the UK today, we appreciate that even this price may be more than some people wish to pay. That’s why this particular summer house earns its place on our list; it’s the second cheapest building of them all at not much more than three hundred pounds, and yet it still has a lot to offer the customer and with a traditionally rustic appearance it can look pleasing on the eye particularly if it’s given coats of paint or wood stain to protect it from the sun as we recommend. As might be expected in a summer house as affordable as this, overlap cladding is used, but as every millimetre can make a real difference once assembly has been completed we were pleased to see that the cladding used here was 8mm rather than the 7mm thick overlap cladding we’ve seen used on some buildings, We also liked the stable style door which is unique among the cheap summer houses in this guide. It means that the upper glazed section can be opened independently of the lower timber section, and this is ideal for cooling and ventilation purposes. 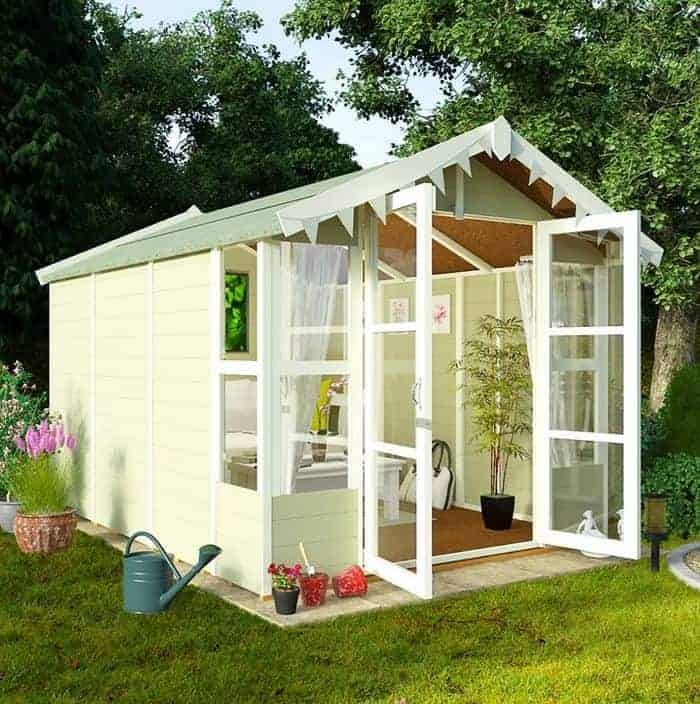 The BillyOh range of garden buildings is typically associated with traditionally styled rectangular sheds and summer houses, but we were pleased to see that they also produce very high quality yet cheap summer houses in a five sided corned design as well. As we often find with corner buildings there are four main areas of glazing, one for each side of the double doors on the central side and two more on the sides next to them. These particular panels stood out, however, thanks to their timless Georgian design and it’s this that makes this such an attractive garden shed to look at. 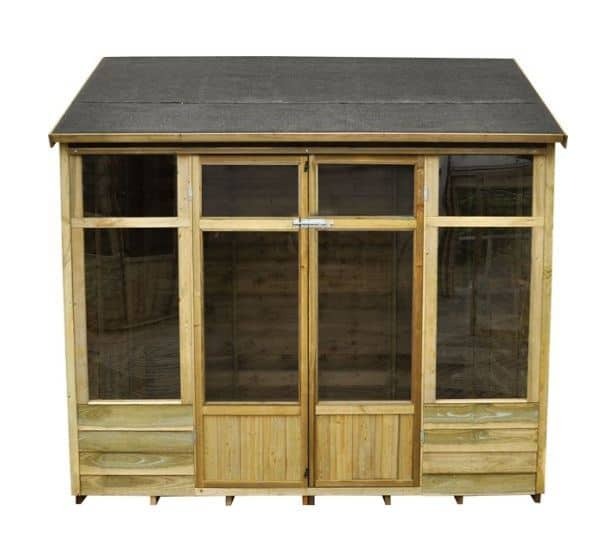 With base dimensions of 2.20m for both the width and the depth this is a mid sized shed when compared to others in this league table and yet it’s towards the top end when it comes to the price. The combination of these two factors accounts for its relatively low position, but on a more positive note it is very well built and although it has only been given an initial dip treatment by the manufacturer it still comes with the reassurance of a 10 year warranty against wet rot as long as the yearly treatment schedule is adhered to by the customer. This is the second of the cheap summer houses in our WhatShed league table to feature a veranda, and we always think they make a welcome addition to a summer house. Typically associated with larger and more expensive buildings, they can add a touch of class to an affordable purchase such as this one, as well as providing an ideal place to stand and look out over your landscaping while still being given protection from the elements. It’s also possible to look out at the garden of course while still inside the summer house, thanks to the two square windows on either side of the single door. If anything, we found the summer house and verandah even more attractive than the model which is placed at third place in our list, thanks to the inclusion of a balcony leading out from the summer house at either side of the veranda. It’s only the lack of any extended warranty which prevents this from achieving a similar lofty position within our list of the very best cheap summer houses, which is a pity as the use of tongue and groove cladding throughout means that it should still prove to be durable as long as the maintenance schedule is strictly adhered to by the customer. Cheap summer houses don’t have to be big to be beautiful or useful, as this compact four foot by six foot garden building shows. Even at this size it copies the good looks of its larger counterparts, and that means that it can become a real talking point for your garden. With base dimensions of 2.02 x 1.22m, with a height at the peak of the apex roof of 1.97m, there’s still enough room to stand up in without having to duck down, and enough room to sit down in a favourite armchair and look out at the garden. The factor that’s most appealing, however, is the price. At a price of just over two hundred pounds, it makes cheap summer houses available to more people than ever before, and yet we were pleased to find that this didn’t mean that corners had been cut. 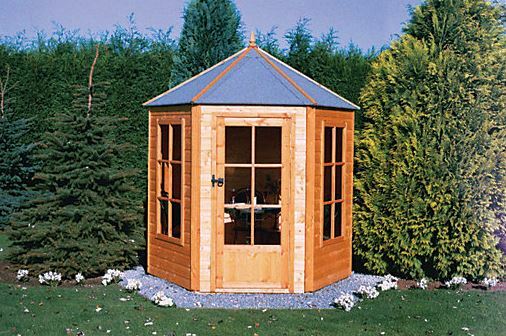 Yes, there is no floor supplied as standard, but that’s in common with other BillyOh timber garden buildings. What we were very impressed with, however, was the use of 11mm thick tongue and groove cladding for the walls. It’s something that we wouldn’t have expected at this price, and means that the summer house is strong and stable once it has been fully assembled. One of the defining aspects of a summer house is that there is lots of glass on display, and this 7’ x 7’ model has more glazing and more attractively arranged glazing than almost any other of the cheap summer houses that we’ve reviewed. It has fully glazed double doors and two long windows alongside them, so that the front of this summer house is completely dominated by its glazing. There are also two long windows on the sides of the building, once again featuring a decorative Georgian style, and we were pleased to see that they could be opened to allow fresh air in whenever required. With a base width of 1.98m and a base depth of 2.05m, this is relatively spacious compared to many other cheap summer houses, and with so much light entering into the interior of the building, as well as its ventilation system, we feel this would make a great auxiliary room to work from on a sunny day. We also liked the tongue and groove cladding, although we would have liked it to have been given an initial pressure treatment, or at least to have come with an extended warranty instead of the basic one year warranty provided by the manufacturer on this occasion. Just because they are eminently affordable, doesn’t mean that they can’t be very stylish as well, and there’s no better example of this than these designer cheap summer houses from Shack Up. From first sight we knew that this was a summer house like no other, with the off set apex roof initially catching our eye. The double doors too are uniquely positioned to the left of centre rather than being in the middle of the front face. The overall effect is very attractive, and unlike any other summer houses that we’ve reviewed. This costs more than many of the other 6 x 4 summer houses we’ve reviewed, but many people are prepared to pay a little more for a designer label and that’s just what they’re getting here. It has been designed by the renowned Wayne and Geraldine Hemingway, and the name of Shack Up is emblazoned proudly on one side above one of the two rectangular opening windows. With a key operated lock as standard and tongue and groove cladding as well, this is one of the cheap summer houses that will turn heads for all the right reasons. Only the price and the lack of an extended warranty stop it from being placed in the top half of our league table. 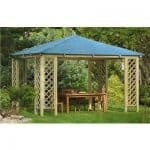 This is a very traditional looking summer house, and yet we know that that’s just what will appeal to many consumers. 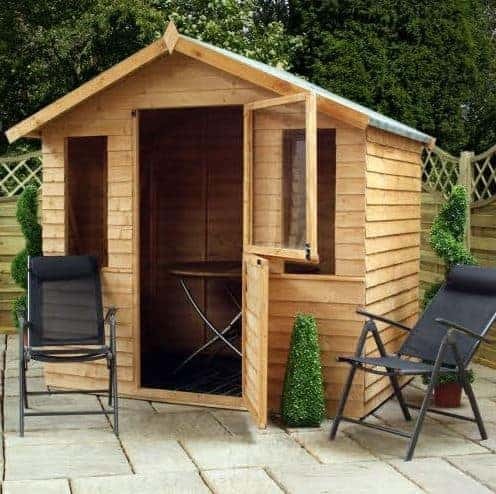 At a price of under four hundred pounds for a summer house with a base width of 2.05m and a base depth of 1.55m we also feel that it represents very good value for money, particularly as tongue and groove cladding is used for the felt covered roof and the floor as well as the walls. This is something we don’t always see, and helped this building achieve its position among our 20 best cheap summer houses that can be bought online right now. A base preservative treatment has been applied by the manufacturer, and whilst we would usually expect that to bring with it a 10 year warranty on this occasion it comes with just the one year warranty that’s a statutory minimum. This is the reason that this finds itself amongst the lowest ranked cheap summer houses in our list, but even this is an achievement to be proud of in what is a very competitive category. 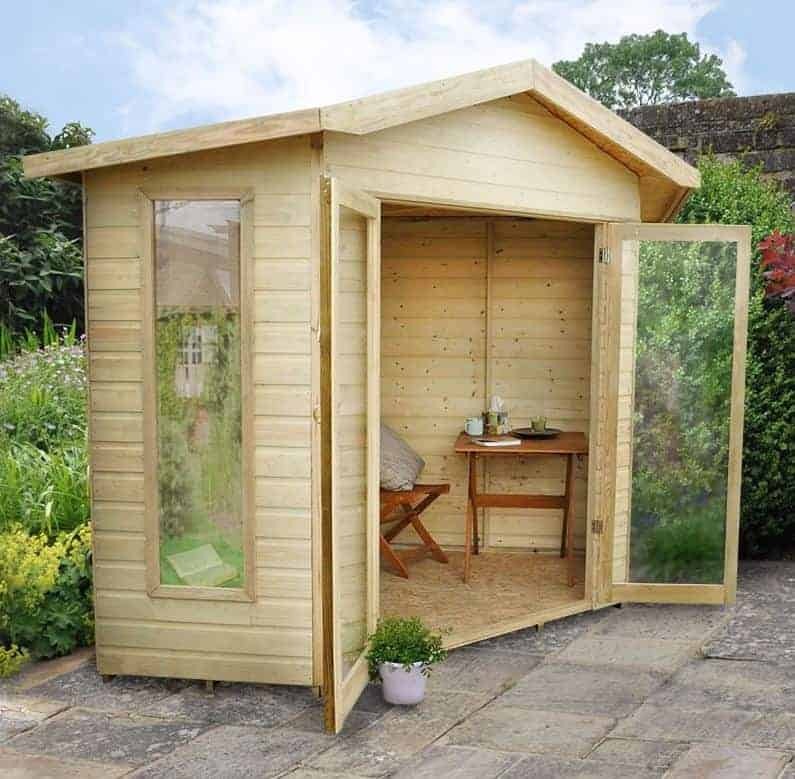 If you don’t mind applying your own preservative treatments on a yearly basis and want a traditionally styled summer house that’s also very affordable then this could be your ideal purchase. At the foot of our list of the top 20 cheap summer houses comes one with a design unlike any other. 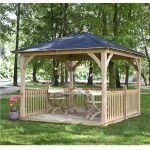 Hexagonal gazebo summer houses are some of the most attractive garden buildings that we review, and so we can easily imagine this becoming a much loved garden feature for whoever buys one. The reason that there are no other hexagonal or octagonal summer houses in our league table is because their intricate designs normally mean that they retail for a price of well over the seven hundred pounds which we’ve used as our cheap summer house. That means, of course, that this garden building represents very good value for money. The single door on the front panel, and the two adjacent sides, have six glazed panels each, so the inside is fully illuminated during daytime hours. For that reason this is one of the cheap summer houses that we feel could be ideal for use as an attractive office for people who work from home. 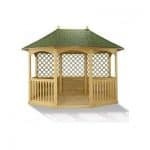 The only reason that this takes twentieth position, rather than one significantly higher, is that we know that some customers have found it quite difficult to assemble and it only comes with a one year warranty, but this is still a gazebo style summer house that has a lot to recommend it a very reasonable price. This was a brilliant website . I have been looking for a summerhouse and this was very informative. Many thanks.